ST. GEORGE – A teenage boy was taken to the hospital Friday morning after he collided with an SUV while crossing the intersection of Main Street and Bluff Street on his bicycle. Just before 8 a.m., a 14-year-old boy was standing on the southeast corner of the Main Street and Bluff Street intersection. Before the traffic signal changed to allow pedestrian crossing, the boy mounted his bike and began crossing in front of westbound traffic on Main Street toward the northeast corner of the intersection, St. George Police Officer Tyrell Bangerter said. As the boy was crossing, the light turned green for the Main Street westbound traffic lanes. A man driving a black SUV was traveling less than 5 mph heading westbound, Bangerter said, when his SUV hit the boy and knocked him off of his bike. 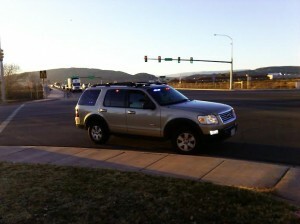 The St. George Police Department, St. George Fire Department and Gold Cross Ambulance responded to the scene. The boy suffered a minor ankle injury and was privately transported to Dixie Regional Medical Center. The boy was not wearing a helmet. Bangerter reminds motorists that they need to obey traffic signals, be patient and wait their turn while driving in traffic. As school is now back in session, he added, drivers need to keep a careful eye out as kids are walking or riding their bikes to school. “You don’t want to get in a bad position for not paying attention,” he said. News LIVE: Bicyclist killed by vehicle hit-and-run; part of Old Highway 91 closed; UPDATED 11:20 a.m.
That description is confusing. He was on the southeast corner (Black Bear) and started crossing towards McDonalds before the pedestrian sign said he could. And then someone going westbound (towards the car dealerships) light changed and that driver hit him? So the driver wasn’t looking at the street and the kid waited until the least possible safe time to cross the street? …….. I called this into 911 on my way to work, the boy WAS in fact wearing a helmet at the time I saw him. Glad he’s okay and didn’t suffer more serious injuries. Hi. The detail about the boy not wearing a helmet came directly from the police department, so that information is according to the report they have and the information they provided our reporter with. Interesting. Well I’m glad that he’s okay either way. Breaking news! man trips on shoelace and skins knee! If the driver was traveling less than 5 miles an hour, sounds like he kind of rolled into the boy. Still not a good thing, but I agree that this isn’t exactly a news story. On the other hand, very little happens around here unless Cliven goes on another tear. where does Main Street cross Bluff Street. I have lived here for 30 years and have no idea where Main and Bluff meet. Does Aspen have a clue what she is writing about? Hi Jeff. Main Street crosses Bluff Street at the southernmost part of Main Street, near Black Bear Diner. At Bluff Street, Main Street turns into Black Ridge Drive. The east side of where the road intersects Bluff Street is Main Street and the west side is Black Ridge Drive and leads to Hilton Drive. I hope that helps. Apparently Aspen does. No apology? Looks like egg on Jeff. someone get a dunce cap for Jeff, ahahahahahh. I hope the cops did not rule out an attempted suicide. Looks like to me helmet or not he might have tried to take his own life. Maybe his parents never taught him how to cross the street using the crosswalk indicators. The bottom line is we all know the driver never yielded to the pedestrian in the crosswalk. Don’t forget the fact that it is Illegal to ride a bike in a crosswalk i.e. cross “walk”. I see it all the time. Bikes have to follow the same rules as cars on the road. I do want to give the kid props for attempting to navigate that intersection at his age. Kids can’t even walk down the street anymore these days. You as parents raise these kids to wear girl pants, raise them to be afraid of everything. If this kid was me, he would have hoped the SUV would have killed him so I would not have the face my parents. My Dad would have kicked my tookass if he found out I got hit by a car. GO FALCONS! Did he get a Happy Meal at McD?